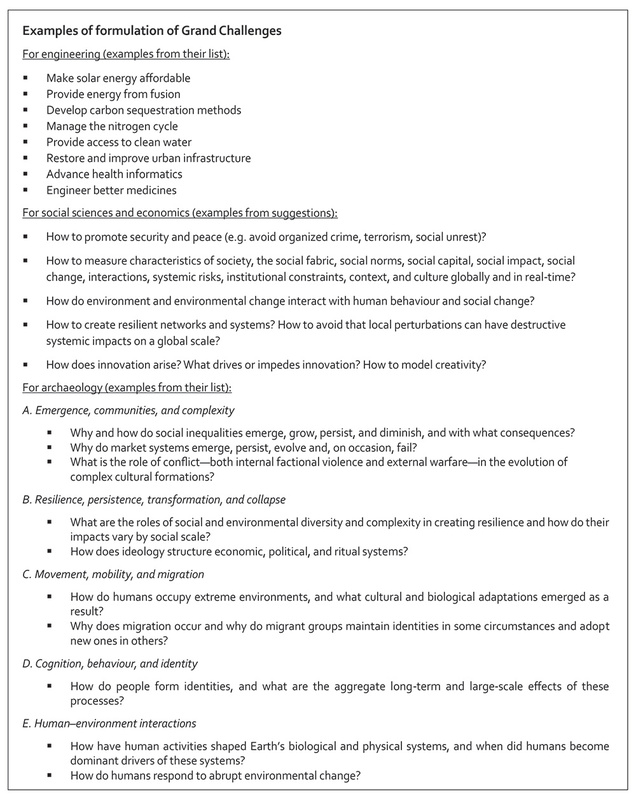 In July 2014 I wrote a short paper for EES Connections in which I asked whether the time was right for the global evaluation community to identify and engage with its own set of ‘Grand Challenges’. Everyone is developing them! Why should evaluation – this young profession with all its potential and challenges – not do so too? I can hear some of you say: But we have the Global Evaluation Agenda (GEA)! Do we need more than that? What is a ‘Grand Challenge’? Grand Challenges were first identified in mathematics more than a hundred years ago (see here and here). In essence, the Grand Challenges articulate those fundamental, intractable problems in a specific field of work that require concerted attention and/or resources to resolve. They are used to initiate a search for innovations that have the potential to radically change the impact of a discipline, practice or profession. Grand Challenges can be shaped by the perspectives of the demand and supply side – in other words, from both those who work in, and who use and benefit from the work done in that discipline or professional practice. They focus on major problems that have global significance and potentially far-reaching consequences. They propose ways to address complex problems. They encourage and mobilise bold, unconventional ideas. They may be granular, but should ideally be bold and sweeping, connecting several issues and concerns together. They have the potential to remove critical barriers to solving a particular problem or advancing a specific area of work. They may have long resisted solution, but are in principle susceptible to being resolved. Each Grand Challenge presents an experiment in the use of a challenge to focus innovation or make impact. 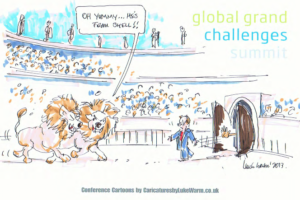 Why bother with ‘Grand Challenges’? There are good reasons for this increasing emphasis on Grand Challenges. The world is both more interconnected and aware of the challenges that confront us all. We live in an era where there is wide recognition that urgent and major advances require focus, collaboration and concentrated resources. We know that those who want to do good or who thrive on challenges need to bring concerted attention and resources to bear across multiple boundaries (disciplinary, sector, geographic, demographic, organisational and ideological) in a search for solutions and innovations. Furthermore, crowdsourcing has become easy and effective. This facilitates both identification processes and the buy-in and mobilisation of expertise and resources. Who already has ‘Grand Challenges’? Over the past decade it has become very fashionable for scientific disciplines, fields of scientific endeavor and professional practices to develop their set of ‘Grand Challenges’. Everyone seems besotted with the idea. It has caught on in many fields such as engineering (see here and here), archeology, global health (see here and here), global mental health, mathematics education, energy, science and technology, health and development (see here and here), and to inspire young engineers. With varying levels of success, efforts have also been initiated for social sciences and economics (see here, here and here), development (see here and here), organisations and management, and mathematical physics. Some are rooted in analyses of humankind’s most intractable development challenges, including in conservation and development. In spite of the strong focus at the global level, a Grand Challenge can also be identified or launched with specific emphasis on a country, region (here and here) or organisation – even just as one event. Several, but not all of these processes have been accompanied by incentives such as grants and prizes (see for example here and here). They certainly serve as an important incentive for action. Perhaps in today’s world, few are driven only by interest in seeing a discipline or profession advance, or problems solved. The table below provides some examples of Grand Challenges formulated in other fields. Examples can also be found in the hyperlinks in this section. 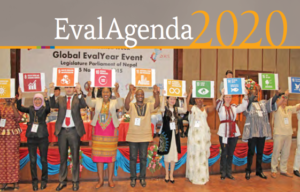 In 2015, the International Year of Evaluation gave EvalPartners the opportunity to release the Global Evaluation Agenda (GEA; also called EvalAgenda2020). The many signatories to the accompanying GEA Declaration expressed their intent to work together towards improving the quality and usefulness of evaluation, and spreading its benefits to all segments of society. support the inter-linkages among these first three dimensions by working together – governments, parliamentarians, VOPEs, UN bodies, foundations, civil society, the private sector, academia and others. Each of these aims can be translated into one (or more) ‘Grand Challenge’ for evaluation. And perhaps that should be done. But I argue that while EvalAgenda2020 is important and helpful, it is not sufficient to be the evaluation community’s set of ‘Grand Challenges’ (Of course, it was also not intended to be that). First, EvalAgenda2020 has not been rooted in an in-depth, shrewd analysis of development challenges that evaluation has to address, among others in a knowledge, human and/or digital economy in the era of the SDGs and Fourth Industrial Revolution. Second, it has an overly strong focus on capacity strengthening – and understandably so, in the context of a young profession’s global thrust– but as a result an insufficient focus on innovation in evaluation. While the evaluation field advances organically as technical and political challenges present themselves, it is rarely given significant impetus to innovate. Initiatives such as Michael Scriven’s Forward Faster Fund are rare! Third, it offers a large number of tactics that have the benefit of contextualisation by country or region, yet does not really inspire focus and concerted work towards reaching technical and development solutions. A focus on evaluation’s Grand Challenges relates well to the call in the Declaration to “commit resources to joint ventures in the conduct of evaluations, and in innovation in the field of evaluation and evaluation capacity development” [my itals]. In the next post I will highlight some reasons why and how we might want to engage with Grand Challenges in evaluation.